Last night six folks joined us on Crow Patrol. We met at the Bashara Boathouse at 4PM to watch where the crows were staging that night. We were fortunate that Jed, the head of the boathouse, invited us to walk through the boat house out onto the deck. It was sunny, 61°, winds at 11 MPH from the west and sunset at 5:07 pm. The Merrimack River still has big icy patches and there was an eastern group of a thousand crows on the ice near the dam and a much larger one way off to the west spreading across the width of the river. 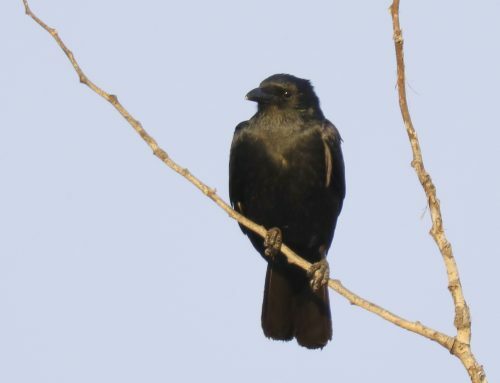 Crows were streaming in from the east and the south joining the western group. Ten Common Mergansers were in the open river across from us and about 25 Canada Geese. What a perfect night to enjoy watching the crows from that vista. More and more swirled around to the west over the ones on the ice. At about sunset, the crows from the west began to stream eastward and we noticed a very large group coming out of the trees on the north side of the river near those on the ice. Wave after wave of crows flew east and disappeared over the eastern group on the ice. What a stunning sight as they streamed by us. As we got in our cars and headed eastward to the Riverside State Park with its open view out over the river, Craig called. 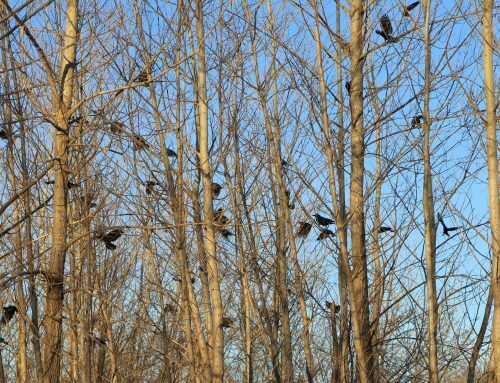 He could see thousands of crows roosting above the eastern group on the ice in the trees around the State’s Water Experiment Station. Those trees extend down to the Riverside Park and we could see them well as we went to the river’s edge. Bob estimated there were 6,000 on the ice then. A large bat flew around us a couple of times. It was now dark and as we began to leave, Craig joined us now about 5:45 PM affirming that many of the crows we had seen from the west were now in the trees around the Experiment Station. 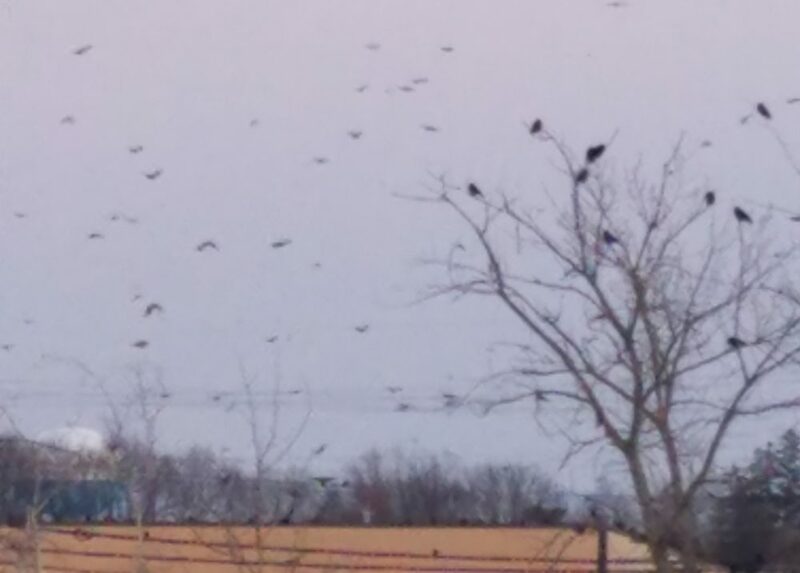 We questioned whether the crows would stay (roost)on the ice so at 8 PM Bob and I returned to find only about 50 birds on the ice (they may have been gulls) and the trees very full of birds. We need to ger more later observation times to confirm their true roosting sight. February 2, 2019 Saturday ten folk joined us to watch the crows. We met at the Bashara Boathouse and watched the direction the crows were flying that night. We found them staging in the Industrial Park to the south of Andover St. to the south of Glenn St. 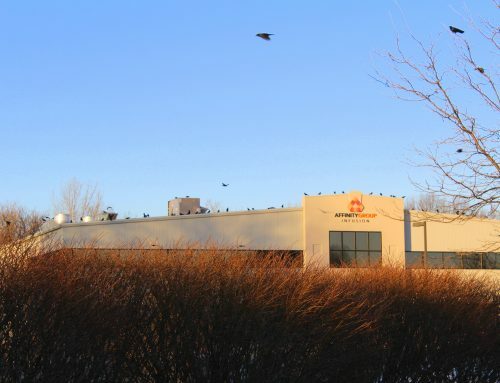 Many fish crows were eating the crab apples on the trees along Glenn St. After Sunset they moved to the northern end of Glenn St and seemed to be in a few trees and on the roofs of the large warehouse buildings. A Red-tailed Hawk was eating a dead crow in the parking lot of one of the buildings. 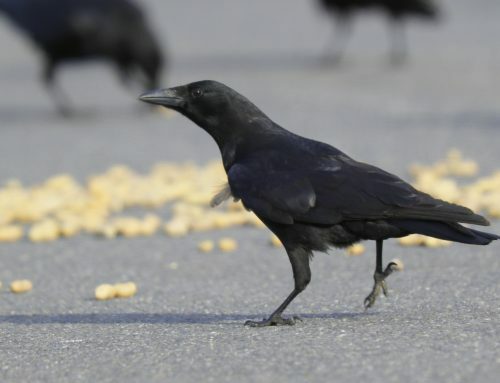 It flushed but could not lift the crow off the ground. February 3, 2019 Sunday Bob and I were out on crow patrol alone. We found many crows staging along the southern end of Glenn St. Bob Was sure others were staging to the west, so we drove along Andover St which became River Rd to Riverside St. and found hundreds down there. We returned to Glenn St. and pulled into a big parking area and looked northward. 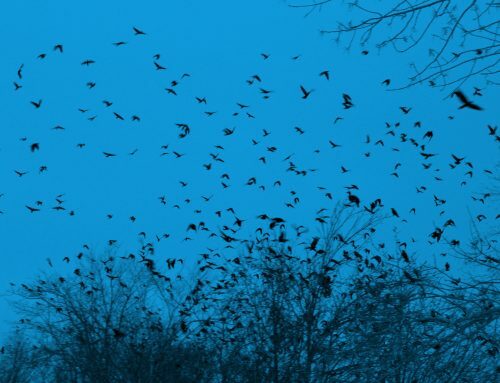 The sky was filled with a continuous stream of crows coming from the west and north – thousands streamed by heading to the north end of Glenn. We went back out onto Glenn and watched, while some were eating crab apples and others sat and called. 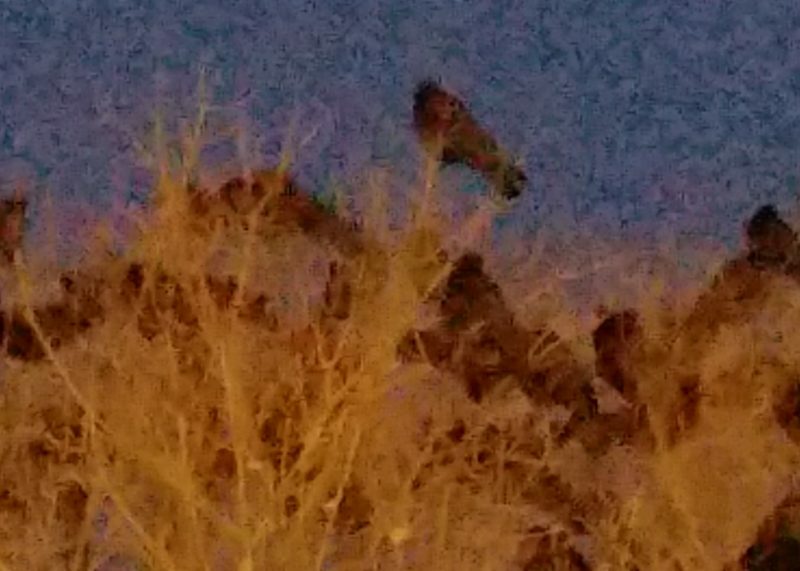 After sunset they all moved northward over Shepard St. and tried to roost in the few trees nearest Andover St. and on the roof tops and some were even on the ground. I recorded the amazing series of sounds they were making. They kept moving about and we were never sure where they would finally roost. The Super Bowl called so at 6 PM we returned home.